Stephen Harper has received some flack for his decision to skip Barack Obama's address to the UN on climate change, in favour of a photo op at the Tim Hortons Innovation Centre. Edge: Tims. Hands down. Who didn't cry a little bit? So, it's 3-3 between the two events. Still, I think we all know roughly what Obama will say ("global warming is a threat...we should reduce our carbon footprint...blah blah blah...hope and change...blah blah blah"). Whereas, who on earth has any idea what actually happens at a donut innovation centre? Seriously. Out of sheer curiosity alone, I think I'd make the same decision as Harper. I'm unclear: being present in person for Obama's speech would accomplish what, exactly? I'm sure it's available on YouTube. But if Harper were at the speech, you can bet dollars for donuts that all anyone would talk about was how empty and meaningless a photo-op it was. By paul.obeda@, at 6:46 p.m.
Of course they would talk about how Harper was at the UN for a photo-op. Its because with Stephen There is less than meets the eye. Always. And its a perception he has created all himself. By Jay, at 6:59 p.m.
Harper just looks bad. What Canadain is going to be thinking: "cool! Our Prime Minister is at Tims when every other leader is at the United Nations! He's such a rebel!" By Anonymous, at 7:37 p.m. The false postulate is that the UN is worth having. Therefore, not wasting time on the forum for thugs, thieves and dictators is a positive development. Canada should withdraw from UN membershipeverboa and us the money for worthwhile investments. Like helping the poor people of Africa, not the governments that oppress them. Finally , an issue the Libs can bring down the government on . By Bill D. Cat, at 8:31 p.m.
Looks like all of the credible leaders of the world followed PM Harper's and Canada's lead in walking out on that tyrant from Iran's speech today. The EU member countries were praising Canada's lead, ha. Iggy is worse than Dion, not a leader too. Why is this a tough decision? Harper can always schedule a personal visit with OBAMA if necessary. Who spoke next Libya room half empty? Again why is this a tough decision? 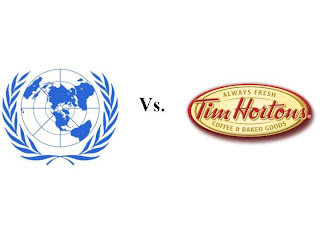 I will take a Tim's run over a UN speech any day. How do you think this will play with most voters in Canada? The US follows Canada in protesting the Iranian Speech. Liberals criticize Harper for not leaving room personally? Liberals are now pandering to the UN for votes? How many people showed up to protest the Iran anti democratic actions in Canada? Another voting Bloc to Harper. Who is advising the Liberals? By CanadianSense, at 8:56 p.m.
By brdwzhr, at 9:16 p.m. When cycling by or taking the bus, I watch the lineup of cars and trucks idling away while waiting for their big morning coffee and donuts at the Tim Horton's donuts takeout. Healthy,eh? By Oemissions, at 9:35 p.m. I think this is one of your funniest posts. By hosertohoosier, at 9:51 p.m.
By calgarygrit, at 10:11 p.m.
fwiw, I don't think this is a bad political move on Harper's part. And the Tim Horton's HQ moving back to Canada (at least on paper) is a tangible accomplishment, his government should be promoting. It would just be nice if serious leaders did serious things. By calgarygrit, at 10:13 p.m.
By wilson, at 11:46 p.m.
PMSH got the attention of the world, standing in a Tim Horton's. Stephen likely told Barack he was going to opt out of the UN meeting, I'm sure O was fine with it. By wilson, at 11:50 p.m.
Palin better watch out: Harper in 2012! By Scott in Montreal, at 12:26 a.m. True, but that's like saying Anne of Green Gables was one of Megan Follows' better movies. By Robert Vollman, at 10:24 a.m.
By nuna d. above, at 1:25 p.m. I was once a peacekeeper. Triple chocolate wins hands-down. (Althoough honestly, I've never seen such a beast). By herringchoker, at 4:25 p.m. I agree H 2 H - Really funny stuff Dan. By Anonymous, at 12:00 a.m.
By Term Paper, at 6:59 a.m. Very well written blog with lots of good links for information. By Knowledge Mass, at 11:01 p.m.
Well job done. Informative post. By Term Papers, at 1:07 a.m. This is an excellent post, it has so many information in it and that is interesting to know. By Custom term papers, at 4:44 a.m.
By Paper Writing Services, at 10:37 a.m.
By Cretu Ciprian, at 5:06 a.m.